So you’ve narrowed down what material you need thanks to our “Learn More About your Plastic Sheet” series - now its time to download a data sheet and take a look at the performance attributes of the materials we carry. But if you’re new to the industry, or don’t work in a technical role, the information stated on material data sheets can leave you more confused than when you started.Our last post discussed heat deflection temperature (HDT) – now we move onto another commonly encountered specification – tensile strength and tensile elongation. Continue reading to learn more! The American Society for Testing and Materials (ASTM) is an organization that defines and sets standards to ensure good quality and workmanship. Over 12,000 ASTM standards operate globally, including tests specific to plastics, to help consumers have confidence that the products they purchase will perform as expected. One of the ASTM test methods for plastic commonly seen on data sheets is the test for Tensile Strength (Yield) and Tensile Elongation (Break). Tests measuring the tensile properties of a given material are often seen with the designation ASTM D638. 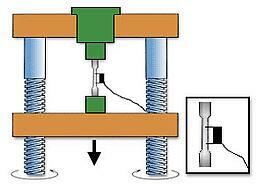 Tensile tests measure the force required to break a specimen and the extent to which the specimen stretches or elongates to that breaking point. These tests produce a stress-strain diagram, which is used to determine the tensile modulus. To conduct the test, specimens are placed in the grips of the Universal testing machine and are pulled until failure. An apparatus called an extensometer is attached to the middle of the testing specimen to measure tensile yield and tensile modulus. Information gathered from these tests is often used to specify a material, to design parts to withstand application force and as a quality control check of materials. Results of these tests can vary depending on the ambient temperature, so in order to get the most realistic results, tests should be conducted in a temperature that simulates the end-use environment for the application. For more information on our products or for help choosing the right material for your project, contact our team to schedule your free material consultation!